I have bought fancier or new-fangled hand tools, but I rarely end up using them. flexible, soft touch rubber-like gloves that come the closest to allowing a good feel and still keep the skin from getting dry from dirt or calluses from grasping hand tools. I have used these Atlas gloves a lot in the past and really like them, but more companies seem to be making similar ones and I found a good pair at Walmart this spring, too. I have never found the old-fashioned fabric gloves to be that useful, but maybe that’s just me. Also, if you want to include a simple, inexpensive way to organize the gloves, click here. 3. Spray nozzles. I recommend the least expensive ones with multiple spray options from a dial on the end. Nozzles tend to get dropped, plugged from hard water deposits, worn out from time in the sun. The expensive nozzles seem to wear out just as quickly as the cheaper ones. Besides, the cheaper ones come in more fun colors. And if you buy the cheaper ones, you can afford more and have them ready on more hoses. I have not found the extended handles to be of significant use, either. 4. Hose repair supplies. Read here what I have learned about hose repair before just buying any old replacement parts. Maybe include a copy of the article if the idea is new to your gardener. 5. Rubber washers. These tend to fall out of hose ends and sprinkler nozzles, which then will not connect without dripping or spraying. Last Christmas, my husband gave me a whole “page” of them, and it has been wonderful to have them on hand! 6. 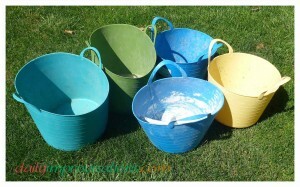 Plastic bins are great for holding everything, from produce to weeding debris. I have seen them in all price ranges, but the cheap ones I bought at Walmart a couple years ago are not showing any signs of wear and tear, and that is not for lack of trying. I leave them around with stuff rotting in the bottom, leave them in the sun, pile them heavy with cucumbers so that I can barely pick them up. So far, they seem indestructible. I was able to purchase these on sale for about $2 each a couple years ago. The front dark blue one has recently been used to hold diatomaceous earth. 7. A supply of yard bags, for collecting debris, may not be the most creative gift, but they are certainly practical. I like the Costco Kirkland brand best, as they are sturdier and a bit larger than those I have purchased elsewhere. 9. A hip bag comes in very handy, especially during planting time when a gardener wants to carry quite a few seed packets around. Seed packets kept in a hip bag are much less likely to accidentally get run through the laundry or left out laying in the yard. For further discussion of the possibilities about what a gardener can use a hip bag for, read here. 11. It can be bit risky, but with a little research, or talking to other gardening friends, you might try buying some unique seeds for your gardener. Maybe it could be something you would like them to grow for you (depending on your relationship with them), or maybe something you have seen or heard about in your travels. That is how I came to love the flower Salpiglossis. My parents came back from Buchart Gardens in Victoria, BC, with a packet of seeds for me. Another variation would be to talk to another gardener you know that has varieties of vegetables or flowers that seeds can be saved from, and save some (with their permission, of course) for your particular gardener. 12. Safety goggles, such as might be needed when operating power tools. 13. Small measuring cups or spoons for measuring solutions for insect, disease, or weed control. 15. He also recommends a particular style of shade hat that his wife bought for him for his many hours in the sun. It has a neck shade flap, as well as provisions for air flow near the top and a neck cinch to keep it from blowing away. It cost about $16 last year. 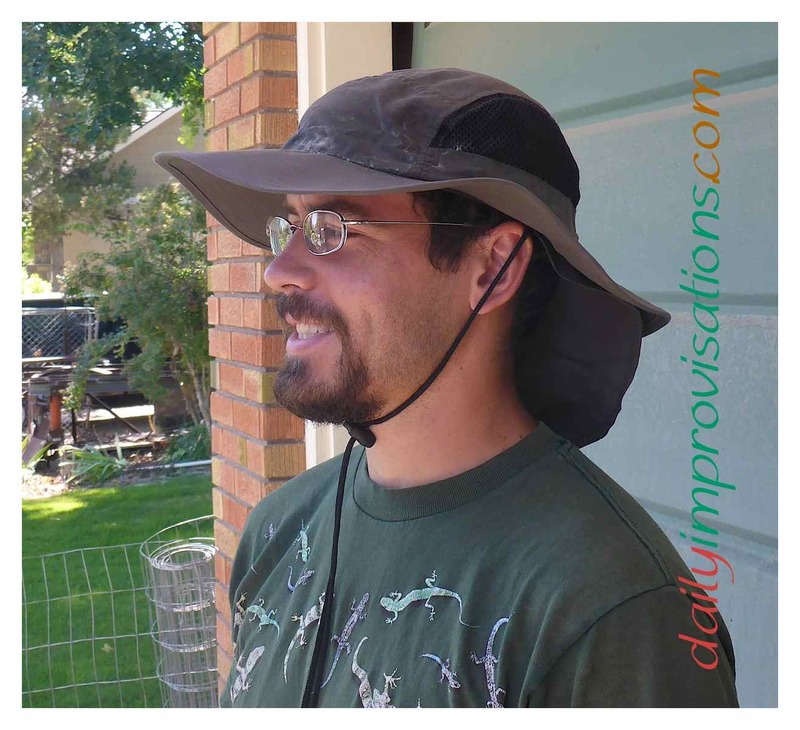 Here is something similar: Wide Brim Men Safari/Outback Summer Hat w/Neck Flap . 16. 100 feet of Netafim and some of the u-shaped pins that hold it in place. See here and here to learn more about Netafim. If you are buying Christmas (or birthday) gifts ahead of time, before you can just wrap them and put them under the tree, and you don’t want to loose them in forgettable places under beds and in dark corners, it is good to have an organizing system. Here is a peak at my gift organizing system, in case you need some ideas for that.